Frida Kahlo's New York is series in progress, a whimsical take about the multiple visits the Mexican artist made to New York in the 1930's and 1940's and imagining her in present time as well. Exhibited in New York City at Word Up Bookstore Gallery, Mark Miller Gallery and Women's Right Historical Park Gallery in Seneca Falls. Manhatitlan is an on-going, award-winning series created by Felipe Galindo. Inspired by the convergence of Mexican and American cultures, the series consists of ink and watercolor drawings on paper and and 3 short animations. The series has been exhibited, published and screened worldwide. 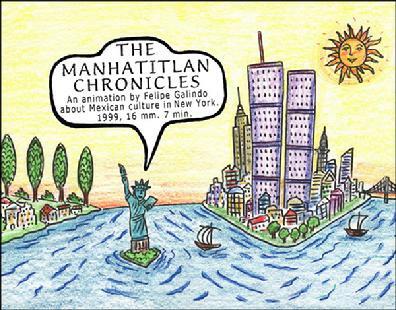 Manhatitlan is a name Galindo coined that merges the word Manhattan (the Lenape-Algonquin name for the island) with the Aztec name of Mexico City, Tenochtitlan. An animated flight of fancy that transposes elements of Mexican culture onto the cityscape of Manhattan. A humorous view on how Mexican and American cultures playfully intertwine. The Manhatitlan Chronicles celebrates the great ethnic diversity of New York, paying homage to the people who constitute its ever changing population. The film consist of 5 humorous segments that underscore ethnic tradition in this era of multiculturalism and globalization. Awards: Best Experimental, Cinefestival 2000, San Antonio, TX; President Award, Ajijic Film Festval, Mexico. Screened at more than 50 film festivals worldwide and cultural institutions (Guggenheim Museum, New York City and the Reina Sofia Museum, in Madrid, among others). Felipe Galindo's new digital animation, narrates an imaginary migration of a group of Mexican people to the US, inspired by Aztec mythology and American history. This animation explores the concepts of homeland, migration and globalization. With music by Blaine L. Reininger (Tuxedomoon). 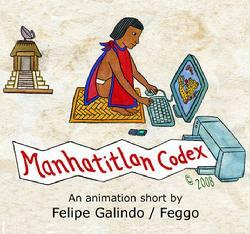 The Manhatitlan Codex is also a traveling exhibition that features works on paper and animation. This series is about an imagined visit the Founding Father makes to present New York City, including one to a neighborhood that bears his name, Washington Heights, and where he spent time during the early days of the Revolutionary War using the nowdays museum Morris-Jumel Mansion as his headquarters back then. Spring, Flight, Tropical New York & Speed of Life. 231st Subway Station, No.1 line, New York City/Bronx. 4 glass windscreens installed at the station's platforms. "In the past it might have been easy for Kingsbridge area residents to go about their daily business without a thought given to their neighborhood's history and surroundings-places like Kingsbridge Hills, Ewen Park, Harlem River, Jerome Park Reservoir, and Spuyten Duyvil Creek. This is no longer the case. Felipe Galindo's Magic Realism in Kingsbridge stems from his study of the area's residents and his hopes that the imagery in his designs will engage the audience, inspiring them to meditate on their surroundings and see things they take for granted in a different way. Galindo says he sought to discover the unexpected treasures in the neighborhood-its life, diversity, nature, and most of all the power of imagination. Each element in the faceted glass panels presents a surprising scene. For example, a tropical island is found in the Harlem River, and a fire escape leads to the heavens, providing a sense of magic. Galindo feels that his artwork, with its combination of urban, natural, surreal and historical elements, provides an opportunity for viewers to experience something intriguing or surprising each time they pass through the 231 Street subway station." (From the MTA Arts for Transit website). The artworks in this section are part of an on-going project of mixed media works. Guided by the graphic qualities of packaging materials, I explore in these works the possibilities of using disposable materials as physical support for my sketched drawings, to make humorous commentaries on every day life scenes superimposed on familiar objects we use and discard. This series has been exhibited as "Used/Reused" and "New York Stories" at El Museo's (S) Files Biennial, Philosophy Box Gallery and Mark Miller Gallery and with the support of LMCC and the Puffin Foundation.